Here's a variation of Discrete Peaceful Encampments: 9 queens on a chessboard (which itself is a variation of Peaceful Encampments). 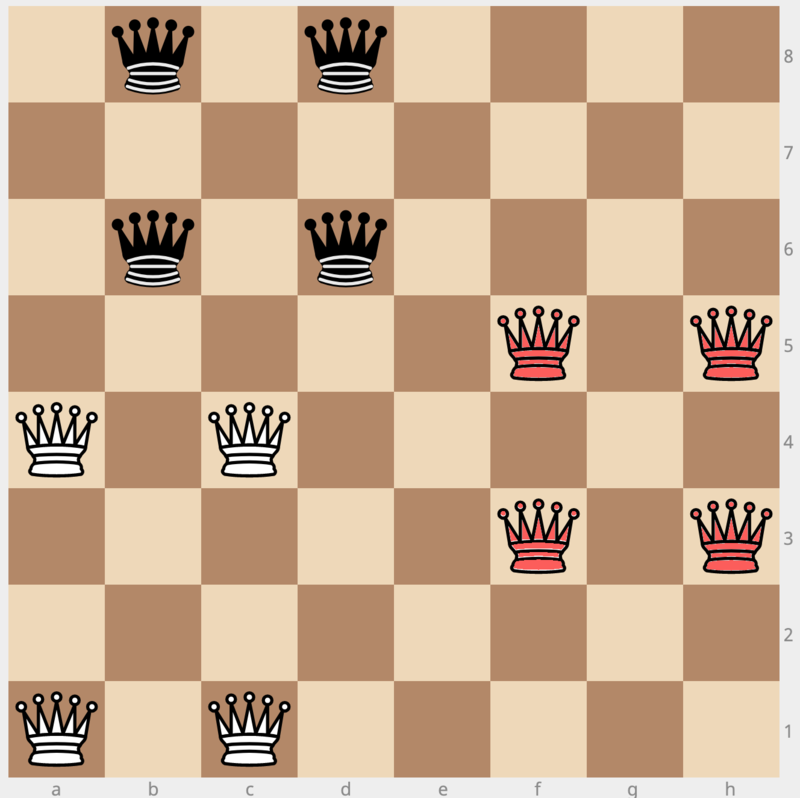 Can you find a way to place more than 4 queens of each color "peacefully" on an 8x8 chessboard? There's no way to get more than 4 of every colour. Also, there is no simple way to prove this. Annoyingly, adding any two colours always excludes every option of adding the third colour, no matter how much you shuffle the pieces around. any two colours to 5, but not all. Also, you could get white to 5 (e1) and red to 6 (g2, g7), but black still stays at 4, so you get a 4-5-6 solution. There's so much wiggle room in the above diagram, and you can get so very very close to a 5-5-5, that any simple impossibility proof (like "there aren't enough diagonals on the chess board") is not going to work. This all is a result of feeding this problem into a highly sophisticated self learning neural network *, making it start from random (and later self-selected) positions, where every improvement path always led to this position, or one of its descendants, showing that this position is at least a local optimum. b) a 5-5-5 solution, or a simple proof of its impossibility. If anyone can provide case b, I'll happily buy that person a beer, after a solid stint of banging my head against a wall. 0 0 . . . . . .
. . 2 . . . . .
. . . . 2 2 . . The orange piece can be any color. 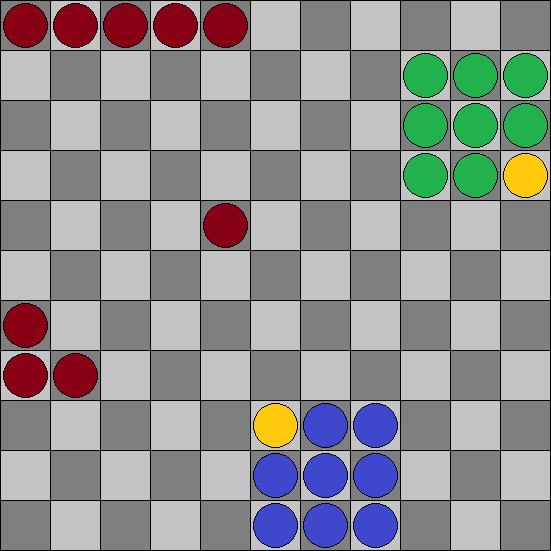 One of the yellow square can the 9th queen of appropriate color, this then has $9+9+8$ on an $11\times11$ board.